The right to potable drinking water is one of the most basic human rights. It is a pivotal limb of the fundamental right to life as there can be no life without water. 2.1 billion people lack access to safe drinking water. 1.8 million people die every year worldwide due to water related diseases, including 90 % of children under 5. Sustainable development Goal 6 is crystal clear; water for all by 2030. By definition, this means leaving no one behind. But today, billions of people are still living without safe water – their households, schools, workplaces, farms and factories struggling to survive and thrive. Children in the inner cities are most affected, as they are more vulnerable to the fatal and devastating effects of lack of access to portable drinking water, often overlooked in terms of access to safe water they need. 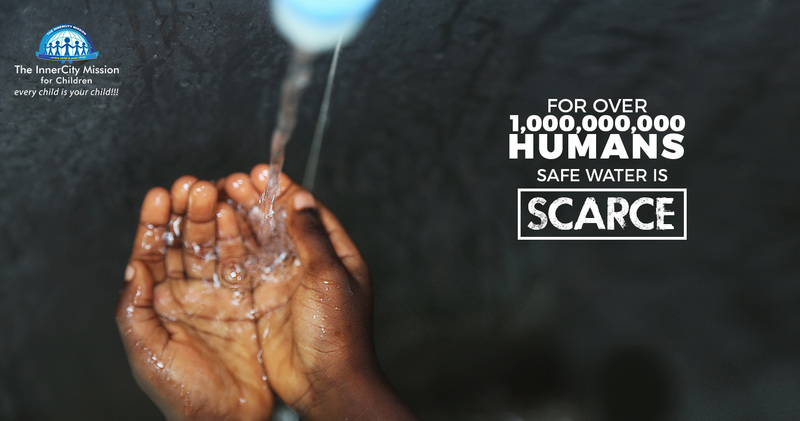 Thousands of them have never seen clean water in their lives. Contaminated water can cause many types of diseases, including Cholera, and other serious illnesses such as Guinea worm disease, Typhoid, and Dysentery. Indigent children who have no access to clean water are prone to these diseases and worse. This World Water Day, 22nd March for the InnerCity Mission is about tackling the water crisis and ensuring that children, especially those living without safe water , have access to clean portable water. we at the InnerCity Mission for Children, lend our voice and hands to the collective global efforts in building a world where every child has access to clean and portable drinking water. It thus behoves us all to rise in response to the glaring need for clean water, even as you take that bold step today in partnering with the InnerCity Mission to give more indigent children free access to potable drinking water, not just in commemoration of today’s celebration, but as a continuous fulfilment of a divine mandate to humanity. Take action NOW. Click here to give an indigent child access to clean water.